STORY: Indians thronged jewellery shops on Monday (November 05) to shop for the precious yellow metal on the occasion of Dhanteras or the gold festival, despite a surge in prices. Jewellery shops in Karol Bagh, the gold hub of national capital New Delhi, were seen buzzing with customers who came early to beat the evening rush. Women were seen trying gold and diamond jewelleries and earrings and bangles remained biggest hits. Apart from jewelleries, silver coated currency note imitations were also favourites among businessmen, which they generally worship on Diwali to later keep in their safes. Ayushi, one of the customer said that she was looking forward to buy a diamond set for her brother’s wedding and since this was an auspicious occasion, she chose Dhanteras for her shopping. 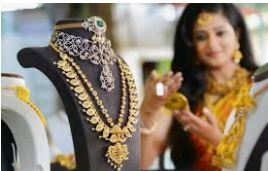 Dhanteras, which falls two days before Diwali, the Hindu festival of lights, is the country’s busiest gold buying day and demand for it peaks as it is considered auspicious to buy precious metals and utensils. There is a huge demand in the country for gold coins with engrossed pictures of Hindu god Ganesha and goddess Lakshmi also. Gold prices in India were hovering around 33,500-33,000 rupees per 10 grams. Subhash Bhola of BholaSons – one of the biggest gold dealers in New Delhi, said that the price never stops any Indian from buying gold, as the metal is considered a good investment and is popular choice for jewelleries but today is the busiest for buying gold because of the astrologically auspicious date.